Life can be unpredictable. Make sure you’re prepared for the unexpected with the appropriate insurance coverage. CJFCU offers a variety of products through our partners that will ensure you have the coverage you need when you need it most. AD&D Insurance is offered through Monumental Life Insurance Company. All credit union members age 18 or older are eligible to apply for coverage. There are no medical questions or physical examinations required for enrollment. Hospital Accident Protection (HAP) is offered through Hartford Life and Accident Insurance Company and pays cash benefits directly to you, the member in the event of hospitalization due to a covered accident. HAP pays on top of other insurance policies you may already have. No medical exams are required. You may also choose single or family coverage. Important coverage on your auto and home is now available through a convenient and dependable source – your credit union. With TruStage Insurance, you may save on auto & homeowner insurance just for being a member of the Credit Union. You may also qualify for a number of other discounts that could save you hundreds of dollars on insurance. No obligation rate quotes by phone – Simply call 888-380-9287 for a free price quote or visit the website. Insurance counselors are available to provide you with professional advice on coverage, rate, discounts, and benefits. If something happened to you today, how would your family maintain their current lifestyle? Central Jersey FCU has partnered with The family Security Plan to offer you an invaluable member benefit which can help you prepare for life’s uncertainties. The family security plan has been delivering affordable insurance products and services to credit union member and their families since 1973. Members may talk to a representative one on one to learn more about cost effective convenient ways of providing financial security for your family in the event of an unexpected death, disability, critical illness or accident. 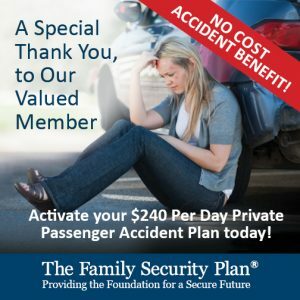 Call today 855-789-4976 or visit The Family Security Plan website today. These products are not NCUA/NCUSIF or otherwise federally insured; are not guaranteed or obligations of the credit union; are not offered, recommended, sanctioned, or encouraged by the federal government; and may involve investment risk, including possible loss of principal. Products may be offered by an employee who serves both functions of accepting member deposits and selling non-deposit investment and insurance products.